A Head Full of Wishes was born out of the frustration of having free web space and having nothing to fill it with - these were the days before digital cameras enabled me to fill up the Internet with endless pictures of my family. In 1994, with the Internet a mere toddler I pinched a bunch of Galaxie 500, Luna and Damon & Naomi lyrics and sleeve scans, threw together a rough discography and launched the website. 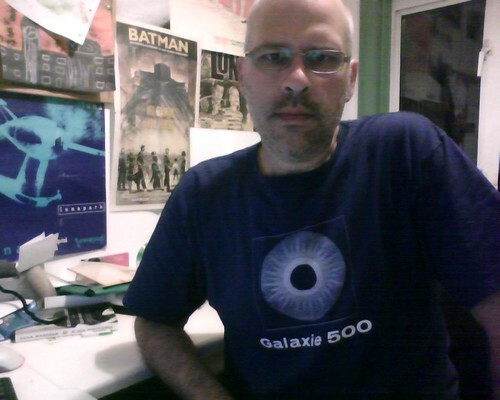 I'd like to say it was the first Galaxie 500 website but Paul Stephenson can lay claim to that honour. But I can probably claim the first Luna and Damon & Naomi websites so I can still feel fairly chuffed with myself. The site chugged along happily through a few designs and domain changes, gave birth to the still lively Galaxie 500 Mailing List and got a name check on the Galaxie 500 DVD (major claim to fame). It now includes Dean & Britta and will cover whatever the rest of the ex-members of Luna decide to get up to. I still can't believe that I've been tinkering with the website for longer than I've been married and longer than I've been a father - I'm not bored yet which probably shows just how tragically sad I am. You can find my personal blog over here: Everything's Swirling. And anything you find searching for "grange85" on Google is almost certainly me.